Update: A special fireworks show is scheduled for September 12 between 9:30pm-10:30pm to cap off the Golden Ticket Awards Ceremony. Weather permitting, of course. See info here. With Memorial Day just two weeks away, readers are starting to ask about Coney Island’s fireworks schedule for the summer! The first Friday night fireworks show of the 2015 season will be on June 19, the eve of both the first day of summer and the Mermaid Parade. This free weekly event continues on Fridays through August 21. UPDATE: Thanks to Coney Island’s City Councilman Mark Treyger, the Friday night fireworks have been extended to include August 28 and September 4. There are Saturday night fireworks on August 29 and September 5 after the Cyclones games. Details below. Friday night fireworks start at 9:30pm and are shot off from the beach. Best viewing is on the Boardwalk from West 10th to West 12th Streets or from the Wonder Wheel. Another popular viewing spot is Steeplechase Pier. 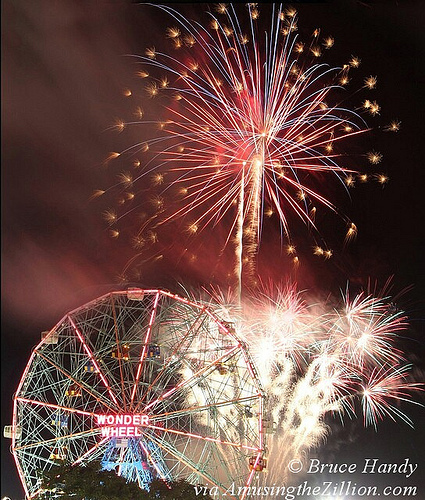 For the second year, the Alliance for Coney Island is presenting a special July 4th fireworks at 9:45pm. The Independence Day fireworks will be shot off from the beach adjacent to the Pier. Best viewing is from the Boardwalk and Steeplechase Plaza. The Brooklyn Cyclones have also announced fireworks on the following eight Saturdays and one Thursday after their home games, including the team’s Home Opener on Saturday, June 20th. Fireworks at MCU Park start when the game is over, so the time varies and is sometimes later than 9:30. Since the Brooklyn Cyclones’ Fireworks are shot from inside their park, best viewing is within and close to the stadium, which is between West 16th and 19th Streets. When the weather is iffy on a day when fireworks are scheduled, or if the show is delayed, check the Coney Island tweeters on Coney Island Fun’s list for updates. Thanks to People’s Playground photographer and resident Bruce Handy for his gorgeous photo of one of the Friday night fireworks shows of the past. Readers are already starting to ask about this year’s fireworks, so here you go: The first Friday night fireworks show of Coney Island’s 2014 season will be on June 20, the eve of both the first day of summer and the Mermaid Parade. Sponsored by the Alliance for Coney Island, this free weekly event continues on Fridays through August 27. Friday night fireworks start at 9:30pm and are shot off from the beach. Best viewing is on the Boardwalk from West 10th to West 12th Streets or from the Wonder Wheel. Another popular viewing spot, Steeplechase Pier, reopened in October after being rebuilt post-Sandy. UPDATE: On June 27th, the Mayor’s Offices announced that there will be a special Fourth of July Fireworks show in Coney Island at 9:45pm on the Beach and Boardwalk near West 21st Street. July 4th is on a Friday this year and a special permit was required due to the holiday. The Brooklyn Cyclones also have fireworks inside MCU Park on the following six Saturdays after their home games as well four other days, including the team’s Opening Day, Saturday, June 14th, and June 16 and June 17. This year every Saturday night fireworks show will have a special musical theme. Fireworks at MCU Park start when the game is over, so the time varies and is sometimes later than 9:30. Since the Brooklyn Cyclones’ Fireworks are shot from inside their park, best viewing is within and close to the stadium, which is between W 16th and 19th Streets. When the weather is iffy on a day when fireworks are scheduled, or if the show is delayed, check the Coney Island tweeters on Coney Island Fun’s list for updates. Thanks to People’s Playground photographer Jim McDonnell for his splendid photo of one of last summer’s fireworks shows. 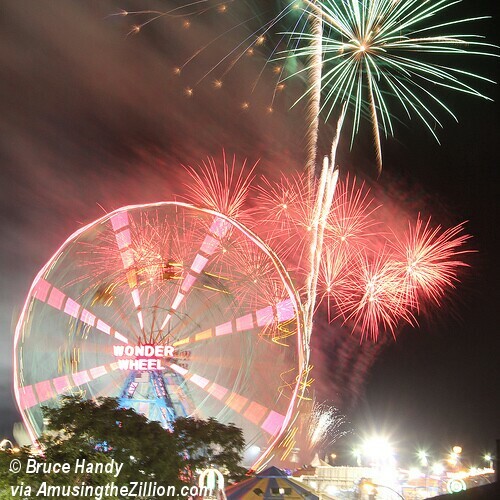 UPDATE May 10, 2014: Readers are already starting to ask about this year’s fireworks, so here you go: The first Friday night fireworks show of Coney Island’s 2014 season will be on June 20, the eve of both the first day of summer and the Mermaid Parade. Schedule for 2014 fireworks is here. The first Friday night fireworks show of Coney Island’s 2013 season will be on June 21, the first day of summer and the eve of the Mermaid Parade. This free weekly event continues every Friday through August 30. 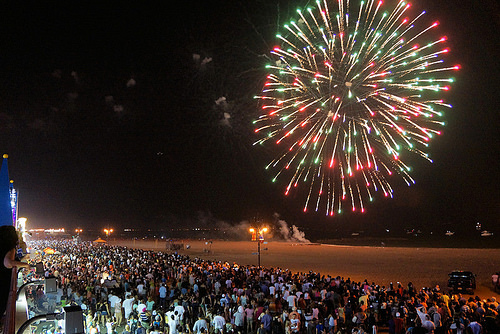 Sponsored by the Alliance for Coney Island, the pyrotechnic extravaganza starts at 9:30 pm. Best viewing is on the Boardwalk from West 10th to West 12th Streets or from the Wonder Wheel. Another popular viewing spot, Steeplechase Pier, is currently under renovation after damage from Superstorm Sandy and expected to reopen in July. The Brooklyn Cyclones have also scheduled fireworks on the following six Saturdays after their home games as well as on one Tuesday – the team’s opening day, June 18th –and one Wednesday, which falls on July 3rd. This year every Saturday night fireworks show will have a special musical theme, including Jimmy Buffett, Bruce Springsteen and the Beatles. Ebbets Field 100th Anniversary, an old-time baseball exhibition, Scout sleepovers and other special events as well as the starting times for the games are listed on the Cyclones promo schedule. The fireworks after the home games are shot off from MCU Stadium located between West 16th and West 19th Streets and are best viewed inside the ballpark or from the Boardwalk or adjacent streets. Admission is free, however donations will be accepted to benefit the Brooklyn Public Library and #ConeyRecovers, an initiative of local organizations working in partnership to assist with the recovery of the Coney Island community. The gates will be open at 4:30 p.m. and all ballpark concessions and restrooms will be available to the public. The event will culminate with a tremendous Fourth of July fireworks extravaganza at 9 p.m., preceded by a performance from the Brooklyn String Orchestra. When the weather is iffy on a day that fireworks are scheduled, check the Coney Island tweeters on Coney Island Fun’s list for updates. Thanks to People’s Playground photographer Bruce Handy for his splendid photo of one of last summer’s fireworks shows. Little Fugitive, the 1953 classic about a 7-year-old boy who spends 24 hours on the lam in Coney Island, returns to Coney on July 1st to open the 3rd Annual Coney Island Flicks on the Beach. This year is the 60th anniversary of the film, which won the Silver Lion at the Venice Film Festival and influenced the French New Wave. “My Dad used to say his veins were full of sand from Coney Island,” said Mary Engel of her film-maker father Morris Engel at a screening of the new 35MM print at Film Forum earlier this year. 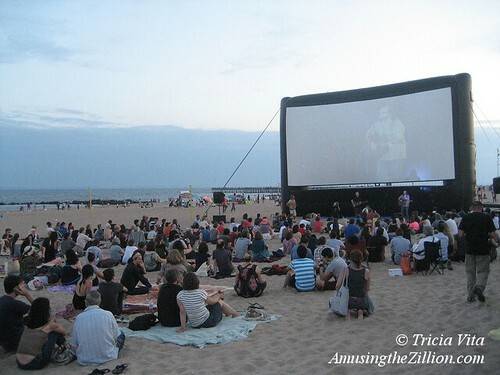 The Monday night beachside film series is a free event sponsored by the Alliance for Coney Island together with Rooftop Films and NYC & Co. Pre-show entertainment begins at dusk on the beach near West 10th Street. For the past two seasons, photographer and film editor Jim McDonnell has released a video titled “Coney Island Dancing” after the boardwalk dancers pack it in for the season. We’re happy to report that the 2012 edition has arrived just in time for, well more dancing on the Boardwalk! The Coney Island Dancers have announced that they are extending their season of free outdoor dance parties with an October Fest from September 29 through Halloween. Posted on Labor Day, “Coney Island Dancing 2012” opens with the legendary Tony Disco before segueing to the legendary dancing doll known as “Miss Coney Island.” Both are charismatic old-timers who are famous in Coney Island and deserve wider acclaim. Nice to see them start this show, which distills a season’s worth of dance moves on the Boardwalk and the Polar Express and at Luna Park, Wonder Wheel Park and the Mermaid Parade and Ball into a joyous four minute forty-five second video. Here are links to Jim’s dance vids from 2010 and 2011 in case you missed ’em. Party on! Edge of the City: Underground NY Shorts By the Sea is a collection of independent short films, including The Best Thing I Ever Done—an endearing account of Domenico DeMarco, owner of the legendary pizza shop Di Fara—and A Man Named Magick, about a charismatic Midtown magic shop owner. The showcase begins at 8:30pm. David Carradine plays Woody Guthrie in this Oscar-winning biopic, set in the Dust Bowl, about the folk artist’s experience with the working class after leaving Texas to join the Okies headed to California in search of work. See Diane Keaton, Mariel Hemingway and Meryl Streep in Woody Allen’s Oscar-winning love story. Jim Henson’s much-loved characters return to the big screen, as Gary (Jason Segel) and Mary (Amy Adams) aim to reunite the gang in an attempt to salvage The Muppet Theater. This feature-length film is actually a long-form dance music video, featuring three dancers who use the cityscape as their stage. The movie is set to Girl Talk’s sample-heavy 2010 album, All Day. Tom Cruise stars as Ethan Hunt in the fourth installment of the Mission Impossible series. Hunt and his team, who are implicated in the bombing of the Kremlin, must go rogue to clear the Impossible Missions Force’s name. The free movie series in Coney Island is sponsored by the Coney Island Development Corporation (CIDC) and NYC & Company in conjunction with Rooftop Films.